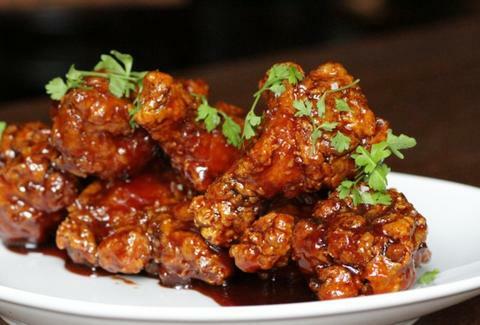 According to nerds, 1.25 billion Buffalo wings will be eaten during Super Bowl XLVIII. 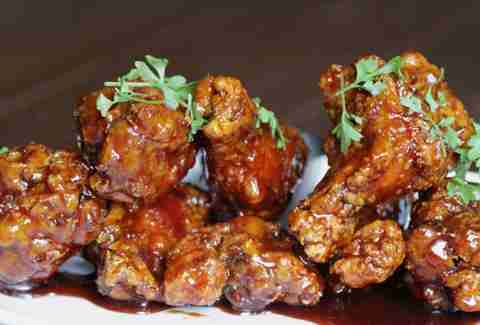 To ensure you don't get Buffalo'd out by Sunday, we found the eight best places to get finger-and-palm-and-wrist... wait, how did you get it on your wrist?...-licking delicious wings that're not hot or red. The owners of OTB in Williamsburg couldn't find any wings in Brooklyn that they really liked, so they made some: these buttery, hot sauce-covered, mustard seed-topped beauts. Right down the street from OTB, the new Motorino (mini wing crawl, anyone?) 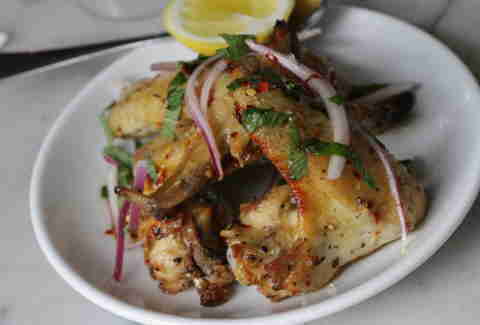 actually has some sneaky-good wings that're roasted and topped with lemon, olive oil, and sea salt that adds some game-upping texture. 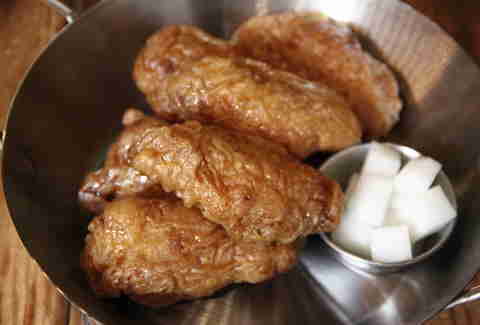 Good God man, you still haven't had these soy-garlic, Korean-style chicken wings with salt & pepper, plus hot & spicy?? Yeah, you're gonna wanna do that. 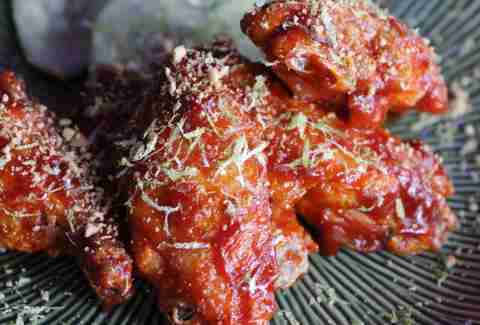 These are more a hybrid between Buffalo- and Korean-style wings, with a homemade gochujang sauce and a couple genre-bending toppings like peanut dust and lime zest. Best of all: you can order them along with Doritos-topped noodles and Tiki drinks. 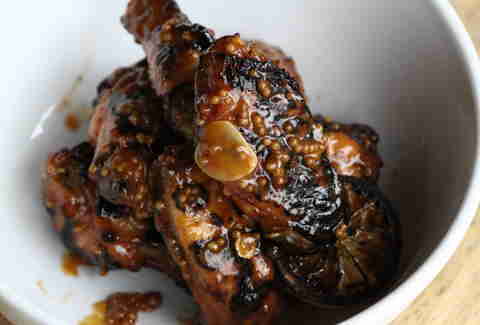 Refined over years of testing at other restos like Momofuku Noodle Bar, Distilled NY's tie-ruiners are twice-fried and lacquered with their signature sweet/savory sauce. They're also utterly delicious. 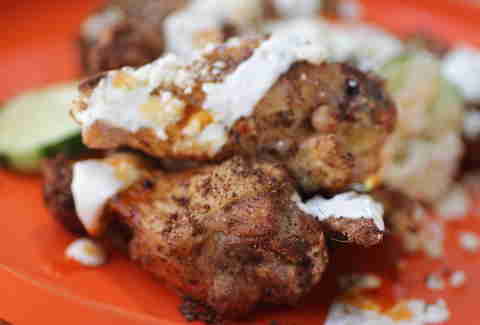 The next-level taco slingers also happen to have a killer wing dish (two, if you count the octopus and turkey wing tacos) loaded with mole spices, chili vinegar, sesame, and crema cheese that gives them the most unique flavor out of any of the wings on this list. Andrew Zimmer is Thrillist's New York Editor, and would probably eat chicken wings until he exploded... if only someone would just lay them all out in front of him. Follow him on Twitter and Instagram.